Presidential candidate Hasan Rowhani has showed his true colors this past week. With the release of a 30-minute documentary on his life, and the first open presidential debate, the once-believed centrist conservative has emerged as a reform-minded politician seeking to “reset” Iran if elected. His supporters have given his campaign the color “purple”, in what is quickly emerging as the country’s latest color revolution. As one of the eight candidates approved to run in this year’s race, Rowhani is the only cleric, and non-surprisingly is close to the Supreme Leader Ali Khamenei. However the relatively unknown contender has taken the national stage by storm. Some elections polls even have him as the front-runner of the race with a comfortable lead over the other candidates. It should come to no surprise considering the bold pledges he has made this past week. While Rowhani’s opponents speak about “resistance” as their foreign policy to deal with western powers on the nuclear subject, Rowhani insists on reconciliation as the main tool to secure the country’s nuclear program. As Iran’s former top nuclear negotiator who led the country’s most successful talks with the West under Khatami’s presidency (1997-2005), Rowhani is committed to standing up for Iran’s right to enrich uranium. However, he, like Khatami, also understands the reality of having to negotiate with western powers. For Rowhani, improving relations with the United States and its allies is a crucial first step in making headway in the nuclear-talks. A Rowhani presidency in regards to foreign policy would undoubtedly be reminiscent of Khatami’s term in office–A time when Iranians weren’t embarrassed to be Iranians. Rowhani has also called for a “reset” in Iran’s economy, which he says will be a priority for his administration. Inflation has soared under the Ahmadinejad presidency as a result of mismanagement, corruption and the economic sanctions. Unemployment has reached to a national average around 14%, but as high as 46% for women and 25% for men in some urban areas. Social and political freedoms as well as diplomacy stand as the main pillars of Rowhani’s economic plan. It goes without saying that if Iran is willing to make the necessary concessions that would prompt the US to soften its economic sanctions, that a huge burden would be removed from the Iranian economy, and more importantly, the average Iranian family who has arguably suffered the most from the nuclear stalemate. This would not be far-fetched under a Rowhani presidency–It was, afterall, under his leadership during the nuclear-talks in 2003 where Iran once agreed to suspend it’s uranium enrichment completely in what became the “Sa’dabad Agreement”. Rowhani also insists that the key to solving economic corruption is enhancing social and political freedom, such as lifting restrictions on the press and media in order to keep the government accountable. 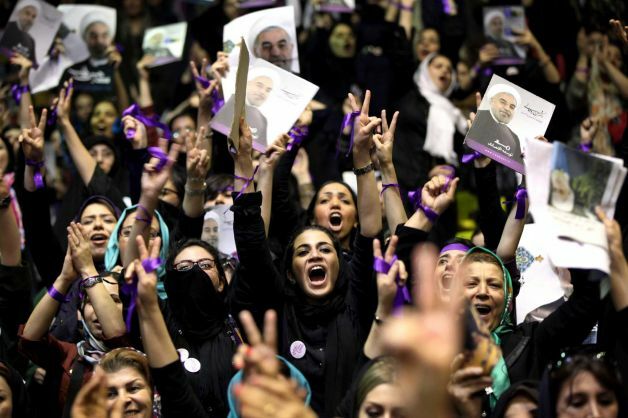 However, what has prompted the public to give the Rowhani campaign the feminine color purple has been his commitment to fight for women’s rights. “In my government, differences between women and men won’t be tolerated”. This one-liner said in his documentary propelled women behind the reform-leaning candidate, in an almost like-exuberance for Mousavi during the 2009 presidential elections. It has been women that have given momentum to Rowhani’s presidential bid. In addition to cracking down on unfair policies toward women, Rowhani has said he would create a women’s affairs ministry if elected. His opponent, Saeed Jalili by contrast said that women should continue to do what they are best at–being mothers. Rowhani’s campaign for establishing a government of “prudence and hope” has indeed instilled hope in this year’s race. Reformists will need to reconsider boycotting the presidential elections. Although Rowhani has never been a leader of the Green Movement, and by no means a reformist leader in the past for that matter, his closeness with the Supreme Leader may actually work to the advantage of the reform movement. Unlike any conventional reform candidate that liberal Iranians may have elected for, Rowhani possesses the potential to actually exert influence over Khamenei because of their special relationship. Giving him independence and some form of political power, for Khamenei, is also key to re-establishing legitimacy in the Islamic regime, while not having to concede much in return. The purple revolution has brought life to the presidential elections that it badly needed. While Rowhani is unlikely to gain the momentum that Mir-Hossein Mousavi was able to in 2009, his emerging purple revolution could revive the Green Movement. At the minimum, his campaign shows that the reformist platform for diplomacy, transparency, political freedom and women’s rights is not dead. If anything it’s becoming the norm.